Copyright 2017 P. Anthony. Reproduction prohibited without authorization. As history unfolds, it has become more apparent that Pope Pius XII (1939-1958) was far from the traditional pope that conservatives and many in the Traditional Movement have made him out to be. Not only were a number of his key appointments Modernists (the most notorious Hannibal Bugnini Secretary to the Commission for Liturgical Reform), but his commitment to traditional theology (Mediator Dei) have, in the light of some seventy years, come into question. Pius XII’s changes to the Holy Week rites (inspired by Bugnini) were quite dramatic and can now be seen as a precursor for the revolution which took place at the Second Vatican Anti-Council (1962-65) and the "reforms” which came in its wake, especially the promulgation of the New Mass by Paul VI (Montini). 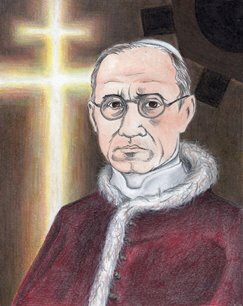 Prior to becoming pope, Pius XII (Cardinal Pacelli) had wide experience in the Vatican hierarchy including his appointment to the powerful post of Cardinal Secretary of State in 1931. The position naturally meant that Cardinal Pacelli would be involved in the political affairs of other nations and more so with those of significant Catholic populations. The Cardinal’s involvement with the framing of the 1937 Irish Constitution reveals that the future pontiff was quite modern in terms of oecumenism which adds to the evidence that Pius XII was far from a traditional pope in the mold of St. Pius X, (1) but was a transitional figure who, with his subordinates, laid the groundwork for Vatican II. The original wording raised vehement protests among some of the "republican- minded” elements of de Valera’s cabinet who contended that it would lead to religious and civil strife between Protestants and Catholics. De Valera backed away from the "full Catholic ideal” in the original document and through a representative to the Vatican argued for a less forthright position. Bishop McQuaid was intimately involved in the drafting of the Constitution and was reportedly livid at its final wording. (7) At this point in his life, McQuaid was under the influence of Frs. Fahey and Cahill, both of whom were against the recognition of any sect or denomination to be part of the Constitution. By the 1960s, however, McQuaid, as Primate of Ireland, was to play a pivotal role in the implementation of the Vatican II reforms. While the future Pius XII could live with such a capitulation, it is highly doubtful that his saintly predecessor, Pius X, would have gone along with such a sellout. Recognition of false religions and sects could simply not be tolerated and if permitted would lead eventually to the de-Christianization of society which is what exactly happened not only in Ireland but throughout the West. In spite of Pius XII’s laudatory words, Ireland, after twenty years of constitutional rule, was well on its way to becoming a modern welfare state. And, as history has shown with the emergence of nation states through the French Revolution and especially after the creation of Bismarkian social democracy, the Christian social order was eventually brought to an end. The modern welfare state, as predicted by its critics, has had a deleterious effect on the peoples which have adopted its tenets. Nearly all of the natural and Christian virtues that make for a healthy culture decline under social democracy. The welfare state encourages sloth, promiscuity, divorce, infantilism, criminality while breaking down the social bonds which are essential for a well-ordered society. The welfare state would replace nearly all of the functions and duties that the Church had once performed and with it a decline in its status in nearly every land. Ireland would not be immune to its effects. Religious liberty and false oecumenism are integral components of social democracy. Every religion, creed, belief or idea, no matter how erroneous or crazed, must be acknowledged and recognized. This, of course, is heretical and runs counter to two millennia of Catholic thought. Error cannot be tolerated by public authority and must be driven underground or extirpated as to not cause scandal or lead souls to perdition. The Church, unlike all other organizations or groups, is a supernatural institution created by the Divine Savior of mankind as the earthly median for the salvation of souls. Its status is not confirmed and or "recognized" by any earthly body, but receives its legitimacy from Christ unto which every creature and social construct is subjected to. Only the Catholic Church was given the Divine Commission to teach and convert all peoples, no other religious organization, sect, or individual was given such license. All remember how John, the very Apostle of Charity, who in his Gospel seems to have opened the secrets of the Most Sacred Heart of Jesus and who always inculcated in the minds of his disciples the new commandment, ‘Love one another,’ had wholly forbidden them to have relations with those who did not profess entire and uncorrupted the teachings of Christ. ‘If anyone comes to you and does not bring this doctrine, do not receive him into the house, or say to him, welcome.’ Since charity is founded in whole and sincere faith, the disciples of Christ must be united by the bond of unity in faith and by it as the chief bond. In the nearly six decades since Pius XII’s passing, it has become clearer that his reputation as an orthodox defender of Catholic Tradition has been tarnished. His position on the Irish Constitution has added to a growing amount of evidence that, in a number of areas, he was quite modern. It would be hard to deny that his later pontificate, especially the significant changes to Holy Week and those that Pope John XXIII instituted on his behalf, laid the foundation for the revolution which was to come at Vatican II. If Pius XII had rooted out the Modernists as St. Pius X had courageously done, then Vatican II most likely would have never taken place and the Church and world at large would not be in their deplorable spiritual conditions. 1. It is ironic that Pius XII canonized his saintly predecessor in 1954 who was an arch enemy of the likes of Bugnini and who removed many Modernists from prominent positions in the Vatican and in the universities. This was one of Pius XII’s finer moments. Yet, although certainly deserving, especially for the times he lived, Pius X’s elevation to sainthood in such a short time (40 years) was a bit surprising. The last pope canonized before him was St. Pius V in 1712, one hundred and forty years after his death. While it must have rankled the Modernists at the time and still does that their arch enemy was made a saint in such a short time, it could also have worked in their favor and have been a precursor for the utter travesty that Newchurch has made the "saint-making process." 2. A recent article about Reverend Edward Cahill S.J. can be found in the January/February, 2017 issue of History Ireland, vol. 25, no.1, pp. 32-34. 3. Historians and writers usually describe McQuaid, Cahill, and Fahey as "extreme," "ultraconservative," and, of course, "anti-Semitic." A typical example can be found in the work of Tim Pat Coogan, Ireland in the 20th Century (New York: Palgrave Macmillan, 2004). 4. Quoted in Coogan, Ireland in the 20th Century, 220. 7. John Cooney, John Charles McQuaid: Ruler of Ireland (Syracuse, New York: Syracuse University Press, 2000), 100. 9. Posted on Lux Occulta website, 28 January 2011. 10. Quoted in Fr. Denis Fahey, The Mystical Body of Christ in the Modern World, 3rd ed. (Palmdale, CA. : Christian Book Club of America, 1939; 1994), 246.